Johnson grew up in poverty in Tennessee and rose to become a U.S. representative (1843–1853), governor of Tennessee (1853–1857), and a U.S. senator (1856– 1862). He opposed secession and was alone among the Southern senators in remaining in the Senate and refusing to join the Confederacy. President Lincoln named him military governor of Tennessee, and in 1864 chose him as his running mate. On Lincoln’s assassination in April 1865, Johnson succeeded to office. 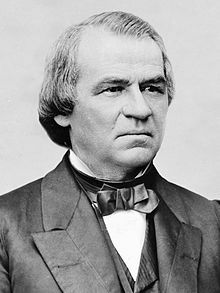 His advocacy of lenient treatment of the South after the Civil War angered Radical Republicans in Congress and precipitated his impeachment in 1868. He was acquitted by a single vote in the Senate and served out his term virtually powerless.